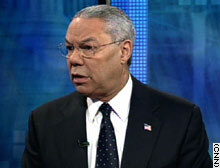 WASHINGTON (CNN) -- Calling himself a "strong proponent" of affirmative action, Secretary of State Colin Powell said Sunday that he believes race should play a role in university admissions. "I wish it was possible for everything to be race-neutral in this country, but I'm afraid we're not yet at that point where things are race-neutral," Powell said on CNN's "Late Edition." "I believe race should be a factor among many other factors in determining the makeup of a student body of a university." Powell's statement goes further than friend-of-the-court briefs the Bush administration filed with the U.S. Supreme Court last week opposing the University of Michigan's affirmative action admissions policy. In two briefs filed Thursday with the Supreme Court, the administration did not specifically address the question of whether race could be used as a factor in considering admissions, emphasizing "race-neutral" options. The briefs support one white student who applied to the law school and two white students who applied to the undergraduate program. The students' admissions were denied. Meanwhile, Sunday evening, the White House announced that Bush will propose a 5 percent increase in funding for historically black colleges, universities and graduate institutions, as well as Hispanic education institutions in his budget for 2004. The statement made no mention of the Michigan case. Powell's explicit endorsement of affirmative action and of the University of Michigan's admissions policy went even further than recent comments of National Security Adviser Condoleezza Rice, who said on NBC's "Meet the Press" that "it is important to take race into consideration, if you must" to achieve diversity within a school. Rice -- a former provost at Stanford University -- was credited by The Washington Post last week with playing a key role in shaping the administration's decision to challenge the Michigan policy. Rice reiterated Sunday that she supports Bush's position. "He has made a case that race-neutral means ought to be tried first. And he has, as president, appropriately left to the court the question of what the limits of the Constitution are in pursuit of diversity," she said. "And I think that's the appropriate place for the president to be." If race-neutral means do not work, however, race can become a factor, Rice said. "If you must take race into consideration, to do it in a way that looks at the total person, that does not assume certain things about a person's race just because of the color of their skin," she said. Powell said he had talked with the president on many occasions about affirmative action and believes him to be "committed to diversity in education," but that Bush felt Michigan's policy went too far. "It's just that he found that the University of Michigan case did not meet what he believed was a constitutional test," Powell said. In the past, Powell had said he believed the university had a strong case, but he and Rice deferred Sunday to the court for the final decision. Senate Minority Leader Tom Daschle, a South Dakota Democrat, said on "Late Edition" that considering race is no different from considering athletic skill or whether an applicant's parent attended the school. "I think it may have benefited President Bush getting into Yale. He was a 'son of ...' at that time, and it didn't hurt there, and he got in, and I think he was able to show that he could be a student of standing," Daschle said. "All we're simply saying is that there are a lot of different factors that ought to be considered as you really strive to achieve diversity in our society and especially on campus; race is among them." Asked last week whether Bush believed race could be "any factor," White House spokesman Ari Fleischer said the president decided to file briefs that were "narrowly tailored." The University of Michigan denies its admission policy -- either at the undergraduate level or at the law school -- is based on quotas. The Supreme Court has not scheduled arguments in the cases.